AUTHOR INFORMATION: David Moody made his debut with "Straight to You" in 1996. In 2005 Moody began his own publishing firm called Infected Books via which he independently published his books including the popular Autumn series and "Hater" (2006). His books have also been optioned and currently the movie is in production. In 2007/2008, "Hater", its two planned sequels, and the Autumn series were acquired for publication by Thomas Dunne Books. FORMAT/INFO: The ARC page count is 326 pages divided over 41 chapters and eight short interludes. The interludes are narrated from the same third person viewpoint of Mark Tillotsen. The rest of the novel is narrated in the first-person via the protagonist Danny McCoyne. OVERVIEW/ANALYSIS: David Moody returns to the world of Danny McCoyne after last years' "Hater", the sequel picks up where Hater left off. Wherein the Hater plague has struck and converted mass sections of humanity into Haters who roam about looking for the Unchanged (normal) population to kill. Readers are given an introduction as to how the world and specifically the United States has been affected. A couple of third person point of views are given from the normal side before we are rather violently exposed to Danny McCoyne and his fellow Haters. The Zombie apocalypse per say in this world is a bit different then other portrayals, as the Zombies/Haters are shown to be self aware and intelligent. They seek out the normal humans and kill. This is all they can do. Danny has been traveling and killing humans on the other side but he's traveling with a purpose, he's on the look out for his daughter Ellis whom he thinks is also a hater like himself. Thus begins Danny's sojourn where he travels along with a fellow hater named Adam who is a bit more run down than Danny. As they both escape a targeted explosion, Danny begins to reminisce about his former life and begins to wonder whether he will be able to reunite with his daughter. Along the way he comes upon a fellow hater like himself who tells him about a plan, which potentially could solve all the hater problems. Not wanting to commit himself Danny manages to extradite himself but leaves with a promise of sorts that depending on the result of his quest, he might or might not come back. It's from here the story then wildly escalates into blood and gore as Danny tries to locate and reacquire his daughter. The Interludes are interspersed in between Danny's Chapters until they come to a logical conclusion. David Moody has written about a harsh world. The inherent conflict between the Haters and the unchanged is looming as the Haters cannot and will not rest until they have deprived the unchanged of their lives. The writing is rather stark and shows the reader how truly vile a world Danny exists in. David Moody has to be commended for not shying away from the violence prevalent in such a world and especially for not shying away from the after effects of such violence. The world painted is truly bleak and given the viewpoint from the Hater point of view truly makes it that much more revolting to read (however at this point I must say I was completely riveted by the going on in the story). 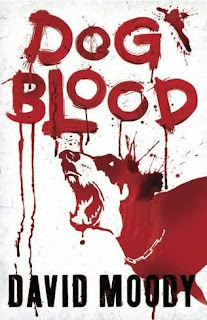 Dog Blood is essentially a sequel and one in which the reader has to read the preceding part to get an idea of the author's plan. Was it a great read, yes, will it be for everyone? Probably not. Readers with slightly delicate sensibilities might have to gird their feelings as they give Dog blood a try. Try it as then you might truly experience how powerfully stimulating the written word can be!